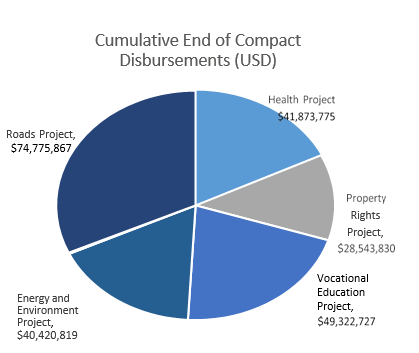 The MCC Compact with Mongolia was a five-year investment (2008-2013) of $285 million in five projects: (i) the Health Project, (ii) the Property Rights Project, and (iii) the Vocational Education Project, (iv) the North-South Road Project, and (v) the Energy and Environment The Property Rights Project included three major activities, Improvement of Land Privatization and Registration System, Privatization of Ger Area Land Plots and Peri-Urban Land Leasing—commonly known as the Peri Urban Rangeland Project (PURP). The $10.1 million PURP activity, is the subject of this independent impact evaluation and represents 3.5 percent of the total Compact. The results described here are interim findings of PURP Phase 2. Other components of the Compact are the subject of forthcoming independent evaluation. PURP, in coordination with local officials, provided exclusive pastureland use rights to herder groups and promoted improved animal husbandry practices, including sustainable pastureland management and adoption of “intensive” dairy farm practices among the project participants. Wells, fencing and shelter materials, and seeds for fodder crops were also provided to herder groups who wanted them. The shift in practices anticipated to result from this project is expected to increase herd productivity, decrease land degradation and ultimately raise herder income. The project was implemented in two phases; the first began awarding pastureland leases in September 2010 in areas around Mongolia’s three largest cities (Ulaanbaatar, Erdenet, and Darkhan), and the second began one year later and concentrated on areas surrounding two smaller regional cities (Choibalsan and Kharkhorin). The results described here are interim findings of Phase 2 of the PURP and focus mainly on short-term changes in behavior such as herd management and rangeland use, but also provide a preliminary look at longer-term impacts on outcomes such as household income. Project impacts are expected to manifest over a period of several years and will be assessed in future survey rounds, the final of which is planned for 2017. Switching from traditional Mongolian cattle to improved-breed milking cattle would improve milk yields due to the higher productivity of improved-breed milking cows. For a more detailed version of the program logic, please refer to the Mongolia M&E Plan, which can be found here: www.mcc.gov. MCC uses multiple sources to measure results, which are generally grouped into monitoring and evaluation sources. Monitoring data is collected during and after compact implementation and is typically generated by the program implementers; it focuses specifically on measuring program outputs and intermediate outcomes directly affected by the program. However, monitoring data is limited in that it cannot tell us whether changes in key outcomes are attributable solely to the MCC-funded intervention. The limitations of monitoring data is a key reason why MCC invests in independent impact evaluations, which use a counterfactual to assess what would have happened in the absence of the investment and thereby estimate the impact of the intervention alone. Where estimating a counterfactual is not possible, MCC invests in performance evaluations, which compile the best available evidence and assess the likely impact of MCC investments on key outcomes. The following table summarizes performance on output indicators specific to the evaluated program. What is the causal impact of participation in the PURP on herder incomes, rangeland carrying capacity, and productivity? What individual and household level characteristics predict higher incomes, rangeland carrying capacity, and productivity due to participation in the PURP? What individual and household level characteristics predict changes in rangeland and herd management behavior due to participation in the PURP? Neighbor Households: A randomly chosen subset of neighboring herder households residing on rangeland plots adjacent (within 2 km) to the 329 herder groups. The evaluation focused on the first and key research question around causal impacts of participation in PURP. Although it was too early to see results in long-term outcomes, the evaluation observed significant evidence that expected short-term changes in herder behavior are occurring in the two project areas albeit differently in each area 6 . This could have been due to differences in environment or implementers in the two areas. Details of these results are summarized, below, and outlined in the chart that follows. Grazing Practices/Maintain Carrying Capacity: Project households in Choibalsan were more likely to reserve a part of their pastureland in case of bad weather but did not adopt other improved grazing practices to improve carrying capacity of This is likely due to Choibalsan not being as overgrazed and degraded as envisioned during project design. Kharkorin project herders maintained lower yearly pasture load per hectare and attempted to control the overall size of their herds relative to comparison households. There was no evidence in either of the two project areas of adoption of other improved grazing practices, such as changes in seasonal herder migration, within season livestock rotation/relocation. Fodder production/storage/use: Project households in Choibalsan increased purchase or receipt of hay/fodder compared to comparison households. However neither project area showed increases in use of hay/fodder. Higher livestock productivity: Contrary to expected increases in livestock productivity, especially milk yields, yearly milk yield per milking cow was higher for comparison households than project households in Choibalsan. No effect observed in Kharkhorin. Decreased herd mortality: Animal mortality rates were lower for sheep and goats for project households in Kharkhorin. No effect observed in Choibalsan. It was too early for the evaluation to answer research question 2 and determine the key characteristics that predict long term outcomes due to participation in PURP as long-term results were not yet expected. The evaluation will address this research question in the final results report. The evaluation was able to partially answer research question 1 by offering one key likely factor in predicting changes in the short-term rangeland management behavior and perception of tenure due to participation in PURP. Specifically, the evaluation looked at data correlations and suggested that whether herders in fact were on land that was overgrazed or over the appropriate pasture load, was likely a key determinant of herder behavior change. The project assumption that Choibalsan was overgrazed was in fact incorrect. As such, changes in rangeland management behaviors were more prominent in Kharkhorin, which was determined by project implementers to be overgrazed. Similarly, herders in Kharkhorin although no significant changes in perceived tenure believed they could prevent herder overgrazing on their parcels. More analysis will be carried out in the final results report to further understand the driving factors in behavioral change. · However, the majority of households (69.5%) feel the leases are beneficial and there was a decrease from 20% to 15% of project households reporting livestock numbers that exceeded the carrying capacity estimated by PURP. Although there is no comparable information for comparison herder groups, we could take this change in pasture load as suggestive evidence of movement toward a sustainable number of animals. · Adoption of better peri-urban rangeland management practices: Project households were more likely to reserve a part of their pastureland in case of bad weather, although there was no similar pasture reserve pattern observed for the purpose of rehabilitating the land. · Improvement of animal husbandry practices: No observable shift of project households using hay or fodder but project households increased by 14% the likelihood of households purchasing or receiving hay or fodder as a gift. *No overall effects seen on livestock productivity or land degradation; however these are longer-term effects which aren’t expected until end line survey. · Lower Livestock Productivity: Contrary to project logic expectation annual milk yields actually were lower per milking cow in project households compared to comparison households. Objective-level Outcomes The activities are meant to trigger a shift in rangeland management practices that are anticipated to increase herd productivity, decrease land degradation and ultimately raise herder incomes. Land degradation is being measured by a separate land degradation survey, but no effects have yet been seen. Final results are expected in 2018. Effect on household income attributable to MCC In the Choibalsan area, there are no detectable differences in the changes of any of the components of earned income between project and comparison households. Project households increased both net livestock income and net earned income by more than comparison households, but these effects were not statistically significant at conventional levels. In Kharkhorin, project households had a significantly smaller increase in labor cost than comparison households. Project households also had a relatively smaller (but marginally significant) increase in non-livestock earned income. A better understanding of land quality should be gathered prior to If the land is not overgrazed or degraded, then although improved herd management and marketing practices may be adopted, practices on land grazing and lowering herds to the carrying capacity are not as likely to be useful or adopted. Different assumptions and strategies are required for peri-urban areas that are around large urban centers versus smaller regional town The more rural areas are unlikely to manifest program effects as rapidly as those right outside urban areas, since those rural areas follow traditional semi- intensive herder practices and hence less cattle and related dairy production, as well as being more removed from markets. Payments/Repayment rates are low and difficult to obtain and likely require further investment on land institutions and sustainability. Lease terms and herder business plans should be documented and monitored through local government officials or risk lack of clarity on parcel and herder Again this requires further building during compact activities of institutions and not solely keeping this documentation at the project implementer and contractor level. The length of time between baseline and follow-up should be based on the project logic and expected timeline of results rather than timing of Compact The original timeline for the evaluation was extended from end of Compact in 2013 to end line in 2018 to allow for short- term and longer-term effects to manifest themselves. IPA recommends waiting at least three to five years after the end of the compact for an additional round of data collection, which should allow for the best understanding of project impacts, as the effects are likely to continue to grow as time goes on, and the survey attrition rates have been very low. When designing survey instruments, evaluators should ensure can collect key factors, including land parcel size, grazing patterns and land quality. Through IPA’s collaboration with the USDA/ARS, land quality and productivity was incorporated into the evaluation via USDA/ARS land quality Measuring grazing patterns using animal tracking devices and/or aerial drones in the future could contribute to data collection efforts. RCTs can increase transparency and are feasible in the land sector. An RCT design although not well received in the beginning was later lauded by local stakeholders as an effective mechanism for providing land rights, including being seen as a transparent process by the In cases where the project has limited funding and/or land available for project treatment, randomization via a lottery can work even in the land sector. Project implementers need to keep and provide accurate records of land implementation (timing and outputs), as well as geospatial location of project areas and parcels. The project implementer should be required to regularly provide detailed project data, including the timing, outputs and specific location and names of beneficiaries of its activities, in a mutually agreed upon format with established standards. Moving forward, documentation created by projects should be scanned, digitized and managed. A final round of data collection is planned for this evaluation in 2017, which will seek to assess the longer-term project effects on herder behavior, livestock productivity and related changes in income. A final evaluation report is expected to be released to the public in 2018. 1. 155 of leases awarded were from Phase 2. Originally 165 herder groups selected but 10 dropped out. 2. 541 of households were from Phase 2. 3. The Project in coordination with local stakeholders drafted proposed land legislative amendments; however, Parliament did not pass this legislation by the end of the Compact. 4. These figures are calculated using the key non-evaluation indicators with targets in the Property Rights Project/Peri Urban Land Leasing Activity. 5. The survey from which the results described here were taken was conducted approximately 2.5 years after the provision of leases in the Phase 2 areas, so it corresponds well to the timeframe of the short-term outcomes. Long- term outcomes are expected to manifest on a longer time horizon, at least three to five years after the start of project activities. The remainder of the household analysis will be organized around these short- and long-term outcomes. 6. There are no project level significant results. Results were only significant when analyzed at the level of individual project areas. 7. Interim evaluation data was collected during Project implementation and long-term effects were expected a few years post Compact. 8. Positive project impact on investment in infrastructure was observed, but the result was limited to animal shelters, which were provided by the project and hence should be considered outputs.